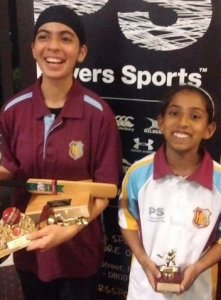 At the recent HPCC Girls’ Prizegiving, two MHJC cricketers took home a haul of trophies. Mansimran Kaur was named Emerging Hearts Player of the Year and Batter of the Year. She also was recognised for scoring two 50’s; 92 not out and 50. Ashwina Krishnakumar was named Player of the Year for one of the under 12 teams. Both girls have made appearances for MHJC teams this year. Well done girls. We are so proud of your achievements.